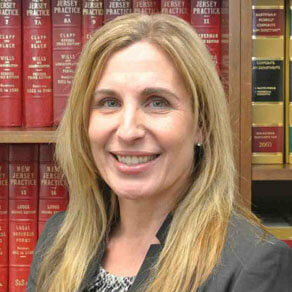 Mary Elizabeth Gazi - Dughi, Hewit & Domalewski, P.C. Mary Elizabeth Gazi returned to Dughi, Hewit & Domalewski in 2013 as of counsel to the firm and was elevated to Partner in 2016. Ms. Gazi’s practice focuses on the representation of healthcare professionals in medical malpractice litigation and on products liability and general liability defense. She has tried to a conclusion over 20 jury trials. Prior to rejoining the firm, Ms. Gazi was a Senior Trial Attorney with the staff counsel office for the MIIX Group of Insurance Companies concentrating in the defense of medical malpractice claims in both State and Federal Courts. Ms. Gazi also was involved in all aspects of the staff counsel’s appellate practice, and argued several appeals before the Appellate Division. Ms. Gazi began her legal career as an associate at Dughi and Hewit, involved in the firm’s medical malpractice department and pharmaceutical practice. She co-authored with Russell L. Hewit and Christopher J. Christie the Appellate and Supreme Court briefs in Strumph v. Schering, 133 N.J. 33 (1993), upholding the learned intermediary doctrine in New Jersey and dismissing a pharmaceutical failure to warn case on lack of proximate cause because the prescribing physician testified he was aware of the risks of the drug and would still have prescribed the medication to plaintiff even with a different warning. Ms. Gazi has served on the Zoning Board of Adjustment for the Borough of Middlesex and the Board of Holy Family Academy. Ms. Gazi served a judicial clerkship with the Honorable Herman L. Breitkopf, Assignment Judge of the Superior Court of New Jersey, Middlesex County in 1989 before joining the firm. Ms. Gazi is admitted to the practice of law in New Jersey and The United States District Court for the District of New Jersey. Ms. Gazi received her juris doctor from Seton Hall School of Law 1989 where she was a member and Associate Editor of the Seton Hall Law Review. Ms. Gazi received her bachelor of arts in English and Economics from Villanova University.